There are dozens of volunteers that ‘toil in the soil’, to make Parkview Neighbourhood Garden the success that it has become in its 5 growing seasons. Gardener Parkview interviewed, Nan Davey, in the first of a series of Spotlight on Volunteers, currently volunteering in her fourth season. 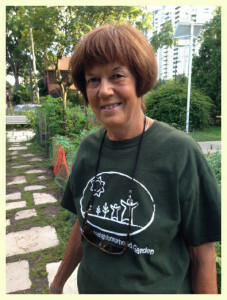 GP: What do you do at Parkview Neighbourhood Garden (PNG)? Nan: A little bit of everything, I work two shifts: picking and selling to customers and garden maintenance. Garden maintenance includes planting, watering, weeding. All aspects of tending the garden. I am also active on the Steering Committee. myself in a city condo, without a garden, but since I was retired, with time to volunteer. GP: What have you learned from Parkview Neighbourhood Garden? Nan: My previous gardening experience was based on trial and error. Here, I am learning from other volunteers all the time. It’s been great working with people who actually know how to garden. Nan: The people. Both volunteers and customers, and people discovering the garden for the first time. I love sharing the story of the garden. I often lead groups, like school children, on tours of the garden. GP: What would you change about Parkview Neighbourhood Garden, if you could? Nan: That’s a very hard question. I like everything as it is, but I am particularly bothered by theft that has occurred in recent. We grow the crops to help people in need, so the thefts, especially bother me. Nan: That’s easy. Yellow Summer squash. When I first came to Toronto, it was kind of unknown. I encouraged the group to grow some and customers love it as much as I do. It’s a very popular seller. Anyone who likes zucchini, likes yellow summer squash. Thank you, Nan, for your years of hard work!